Well, it has been a very looong time since my last blog post( I will explain a little more in detail in the next blog!). But, rest assured that I have been busy working on getting more expose for Lessons Learned as a Bridesmaid! I’m so glad to share what the Lord has been doing since the book’s release last July, and I’m looking forward to even more open doors. In a nutshell, here’s what’s been going on! 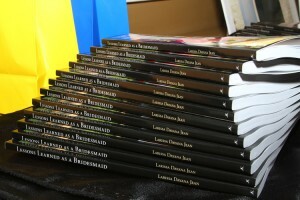 July 12, 2011: Lessons Learned as a Bridesmai d is released! I hosted my very first book signing party! July -August 2011: Upon a few days after the release, Lessons Learned as a Bridesmaid becomes available on Nook, Kindle, Barnes and Nobles and Family Christian online bookstores! September 1, 2011: I had my second book signing at the Dancing on the Promise Annual Dance Conference at Liberty Worship Center in Stone Mountain, Ga.
November 2011: I held a book signing at the Good Samaritan Haitian Alliance Church during an event for their single adults. January 2012: I went live on the radio! Pastor Michele Rucker ( I LOVE this woman of God! ), founder and director of Dancing on the Promise International Ministries, is the host of “Start your day Dancing on the Promise.” Pastor Michele invited me to speak about the book on a segment about single women on WAEC 860am, www.love860.com. January 2012: In that same month, Renewed Magazine, a local Christian magazine, contacted me and is going to feature me in their summer edition of Top Authors of 2012. March 2012: I was invited to a panel for Mothers and Daughters in Jefferson, Georgia to share about some of the topics from my book. April 2012: A good friend of mine started a young woman’s ministry at her church in Atlanta and wanted to use my book as part of their Bible Study! That was so humbling! I’m up to 8 great reviews on Booksneeze!! (Click on the “Book Tab” on the website and scroll down to “Reviews”) My average blogger rating is 4 STARS! With the 1st year anniversary of Lessons Learned as a Bridesmaid rapidly approaching, look out for special news in the celebration of a year’s worth of success!